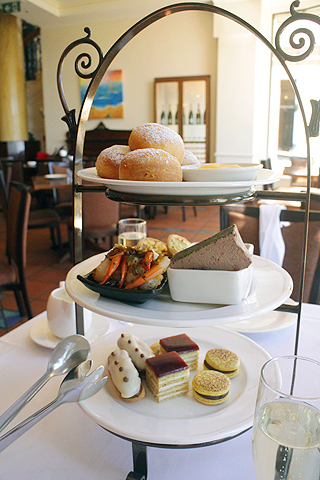 It has recently had a makeover with the addition of the Classical French High Tea. What an absolutely gorgeous and delicious makeover it is! 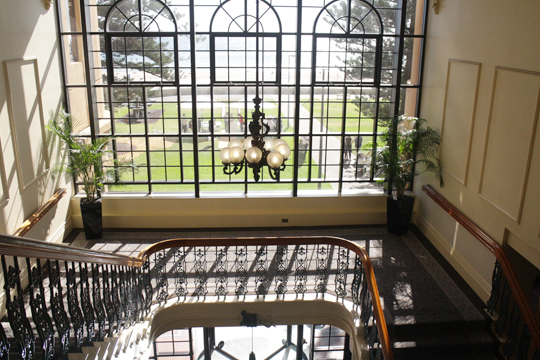 The Stamford Grand Hotel announced last year, multi-million dollar renovations to its hotel and restaurant. 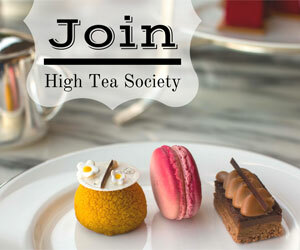 When finished, it will look amazing and match the high quality and taste of the Classical French High Tea. We were greeted with a refreshing glass of Chandon Australia sparkling wine. The table settings were simple and crisp, with plain white Australian Fine China. There was a large selection of Dilmah tea to choose from. I tried the French Vanilla and Almond Italian. French Vanilla should be served in more places in Adelaide. So delicious! My friend ordered a latte and said it was really good. The SA prawns with garlic and chilli were lightly stir-fried with onion and parsley. They were fresh, buttery and delicious with a lemony mayonnaise. The smoked salmon sandwiches are a classic high tea dish with herbed cream cheese and cucumber. They were fresh, light and moreish. The Quiche Lorraine tartlet with bacon, leek and my favourite, Gruyere Cheese, was so nice and we could taste the quality and freshness of the ingredients. The Duck pate with almonds was sourced from local company, Barossa Fine Foods. Even if you don’t like pate, you have to try it! It was so fresh and the French bread style croutons were lovely. My only complaint was there was too much duck pate and couldn’t eat it all, sadly! It would have been very uncouth to stuff the rest into my handbag! I couldn’t wait to try the scones, because our host Raphael said they were made from scratch with flour, butter and kneading. I was sceptical, but my scepticism was wasted! It was a scone miracle! They were delicious, fresh and so, so made from scratch! Thank you Stamford Grand! 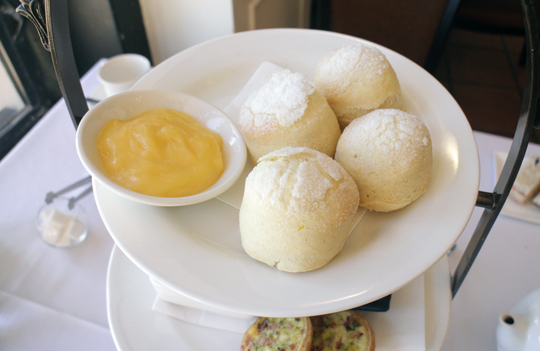 The French inspired Lemon Curd spread was freshly made and a nice touch with the scones. Today we had an orange chocolate Macaron which were perfectly made with a crunchy top and chewy centre. The way it should be. The French inspired lemon and blueberry Madeleine was light and buttery with fresh blueberries. Salted caramel and chocolate mousse éclair was a really lovely flavour and again was fresh. Really nice! Caramelised white chocolate, raspberry and pistachio opera was a lovely sponge with a nice flavour. For an additional $8 on weekends, you can purchase the Sweets Enhancement. Our stomachs were stretched but we couldn’t resist trying the amazing petit desserts that were put in front of us. Chocolate orange fudge melted in your mouth. The fruit tart with fresh berries was light and fresh. Really tasty! The fruit cake slice was nice with fresh berries inside. The standout was the pretzel cheesecake, a tasty and interesting flavour mix of sweet and savoury. The truffles today were white chocolate. 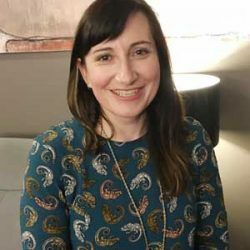 The extremely knowledgeable staff knew what was in their food and where the ingredients were from and pride themselves on being sourced locally. Dilmah would be very happy, as staff knew their tea and the best way to brew it. 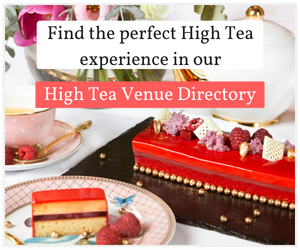 The makeover of the high tea is well worth it! You can tell the Stamford Grand Hotel definitely purchase high quality, local ingredients. 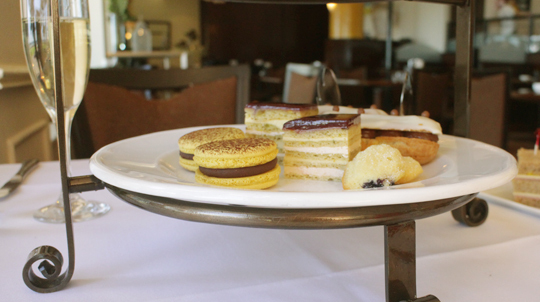 Everything is made fresh on site by their pastry chef, Naomi. She should feel really proud of what she is serving and the staff clearly has faith in her food. 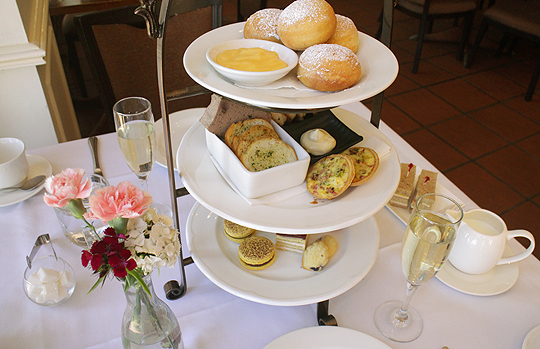 The Classical French High Tea is worth the money and is so decadent and delicious, I couldn’t fault anything! They also cater for allergies, vegetarian and gluten free diets. 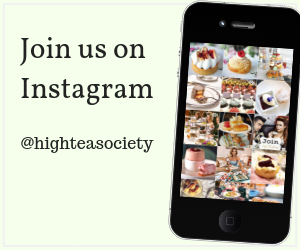 I can’t wait to go back and try their Simply South Australian High Tea!